Regular readers may have spotted that I’m contemplating painting a Transylvanian ally for use with an Early German Protestant army for the Thirty Years War (TYW). I’m so keen on this mini-project I’ve already painted all the samples I bought at Britcon and I’ve moved on to considering my next purchase(s). Amongst these will be the figures for a general and his entourage. Obviously, aside from a white horse, he needs a suitable standard so I began looking for a suitable image. I only wanted an idea as I usually paint my flags by hand. As it turned out Wikipedia was all I needed. 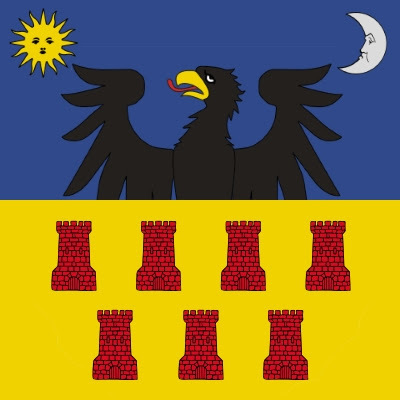 An article on the Translylvanian coat of arms provided a concise history of the arms during the period and some useful pictures. Sadly, all the pictures were before 1597 or after 1665; nothing during theTYW. There was however a brief description of the arms in between. You can download the flag if you don’t want to use the above image. The file contains some brief historical notes and flags suitable for all scales from 15 to 30 mm. Principality of Transylvania from Wappenwiki.